Hey there friends! 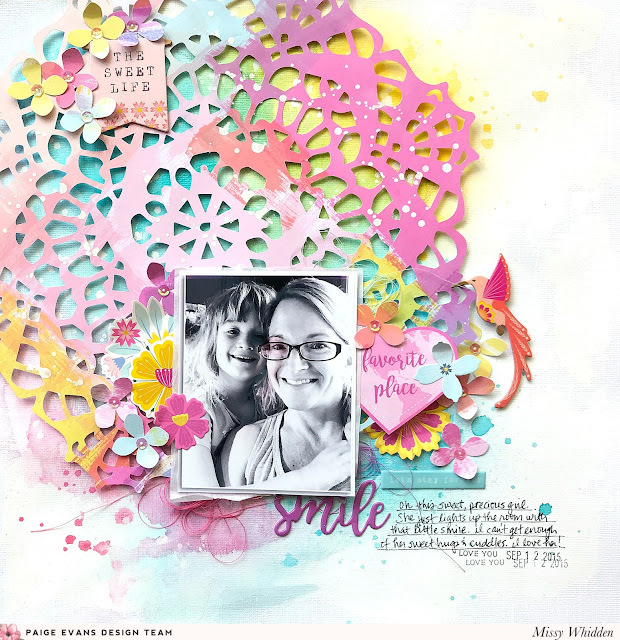 Missy Whidden here and I have a new layout to share using the new Horizon collection. I’ve been wanting to use one of Paige’s Doily cut files for awhile now and I decided to make this one the focal point of my design. I cut it from Paper 24 (from the 12x12 Paper Pad) using my Silhouette Cameo 3. I love the artsy feel of this paper and all the paint strokes and colors were perfect. I used white cardstock as my background and I began by covering most of it with white gesso. I used some blue, pink, and yellow spray inks along with acrylic paint to create the bright watercolor effect. I love how it shows through the cut file and around the edges. I wanted to create some dimension, so I popped the doily up a bit by adding adhesive foam behind it. I went with a black & white photo to create contrast and allow the colors to really pop. 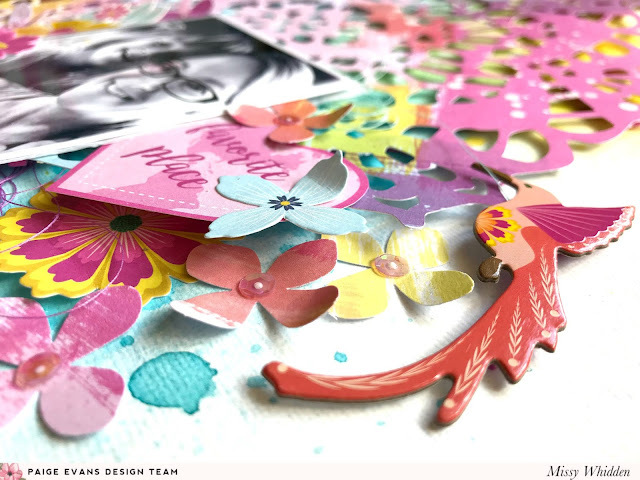 I embellished around the photo using a lot of the Floral Die Cuts, a Chipboard Sticker, and some punched flowers. I used the scraps of Paper 24 to punch the flowers and scattered them around the photo. I also fussy cut a “favorite places” heart from the cut apart sheet in the 12x12 Paper Pad. I went simple with the title and used an Epoxy Sticker. I especially love that it’s purple since I wanted to bring some of that color down to the bottom of the page. I also added in tangled thread for more color and texture. Here’s a close-up of the doily detail. 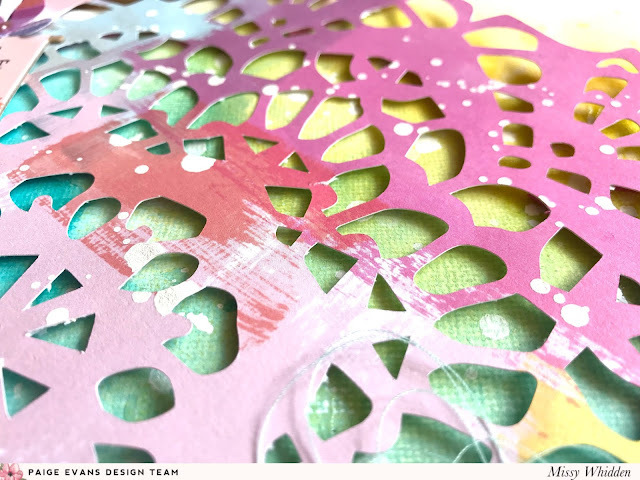 It’s such a beautiful cut file and cutting it on this paper makes a really bold design element. This paper is perfect for those of you who like the look of paint strokes but don’t want to make them yourself. And look how colorful and pretty this is and all I did was cut it out! I did add some white splatters as I finished the page by watering down some white acrylic paint and using a brush. I hope this gives you some inspiration for your next layout! I can’t get enough of this Horizon collection. It’s impossible to not fall in love with all of those amazing colors and patterns! I really loved putting this together. Be sure to check out my process video here for lots more details! This is just GORGEOUS! LOVING those colors!!!!! !